From the brink of civil war to the beginnings of the civil rights movement, Kansas was on the cutting edge regarding questions of freedom and equality. 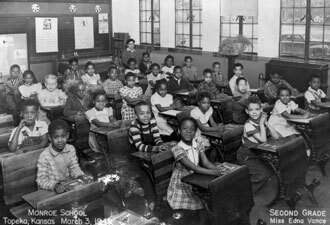 Brown v. Board of Education and the effort to strike down segregation in public schools was the natural evolution of more than a century of battles. The U.S. Supreme Court's ruling in 1954 changed America perhaps more than any other court case in our nation’s history. 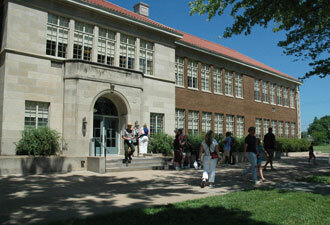 Housed in the formerly segregated Monroe School in the heart of Topeka, the historic site preserves the story of the long struggle to end racial segregation in America's schools. A classic brick structure with gleaming stone floors preserves both the excellence of black schools in Topeka and the injustice of their segregation. Through interactive exhibits and award-winning multimedia programs, visitors experience first-hand the stories and decisions faced by African American students and parents in the battle to end segregation. The Legacy gallery traces the national and international ramifications of the Brown decision. From Martin Luther King's March on Washington to the writing of a new Constitution in South Africa, the impact of Brown echoed across the world. Across the hall in the old kindergarten room, the Expressions and Reflections room offers visitors a place to reflect and share their own thoughts and stories. But your visit doesn't have to end at the park. As the nation commemorates the 150th anniversary of the Civil War, there is no better place to experience our nation's struggle for freedom from the 1850s to the 1950s than in eastern Kansas. Long before the Brown decision, Kansas claimed the nation's attention: the Kansas-Nebraska Act, Bleeding Kansas, the Underground Railroad, and John Brown influenced national policy and debate. Freedom's Frontier National Heritage Area, featuring dozens of historical sites, commemorates the unique role the region has played in redefining freedom and equality in the United States. Just under a mile from the Monroe School is the John Ritchie House. Here abolitionists in league with John Brown operated a station on the Underground Railroad. After the Civil War, Ritchie gave land to free blacks seeking a new life in Kansas, leading to the creation of a black neighborhood in south Topeka. Less than a mile away stands the magnificent Kansas State Capitol. Inside the towering structure is the famous John Steuart Curry mural of John Brown brandishing a sword and Bible, recalling the bloody battles fought to end slavery. While the park and surrounding heritage area preserve a broad sweep of history, the park also hosts a variety of special exhibits and programs. These rotating programs reflect the diversity of our nation's people and ongoing issues related to freedom and equality. At Brown v. Board of Education National Historic Site you can examine the events that led up to the Supreme Court ruling and the Civil Rights Movement that followed. Admission and programs are free. 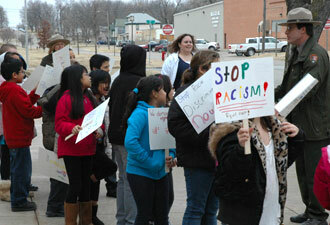 For information about upcoming events visit www.nps.gov/brvb or call (785) 354-4273.